How did an engineless Thames barge reach a downstream berth when the wind died? 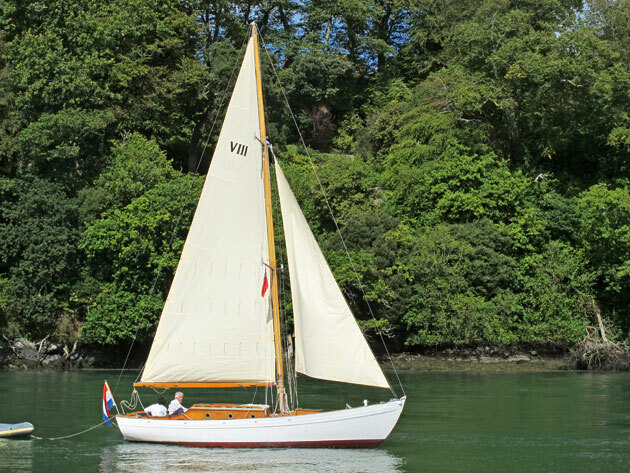 She’d ‘drudge’, by anchoring in midstream with the tide going her way, then heaving up the hook until it just touched. Off she went, pointing into the current, ferrygliding in mid-stream using the water flowing over the rudder. As the tide caught her up, the hook was drudged in the mud to bring her head back into line, and so on. Drudgery, you might say, but it still works today. This is another technique favoured by bargemen and just as useful to us. Beating upriver in a decent breeze, considerable ground can be gained by shooting head-to-wind between tacks until just before critical way is lost. The name for the technique was ‘huffling’. I learned it as a nipper on the Norfolk Broads and never forgot its benefits.